All meetings are open to everyone, but locations may not be known until shortly before. Please RSVP or email us to ensure you receive up to date information. Every voice enriches the conversation - we hope to hear yours! 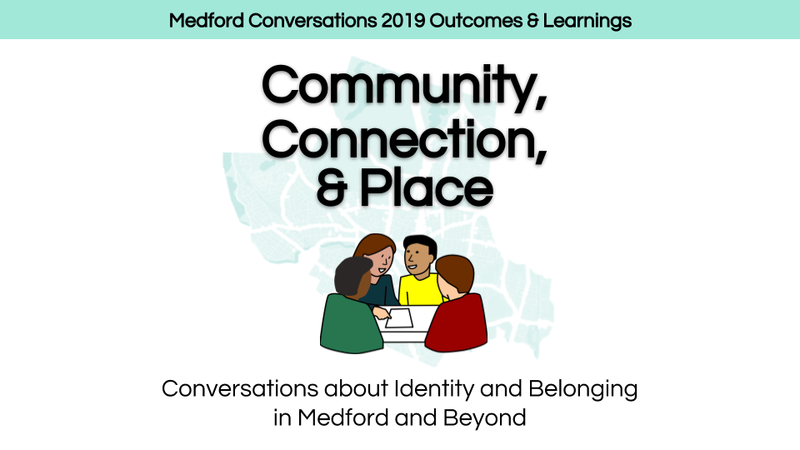 Expanding a sense of connection to Medford through open conversations about the issues impacting our communities, in hopes of establishing relationships across difference, and inspiring civic engagement. We are a volunteer collaboration that arranges small discussion circles guided by trained facilitators. Our annual discussion topics are chosen based on community feedback. Who participates in Medford Conversations? We welcome everyone who has ever lived, worked, prayed, or played in Medford to join us in conversations about the challenges facing our communities. Is Medford Conversations affiliated with any political or religious institution? All of our events are offered to the public free of charge, but due to limited capacity we require everyone to pre-register. We rely on generous donations from community members and organizations. Does Medford Conversations need volunteers? A community forum on the future of the arts, humanities, and creative economy in Medford.